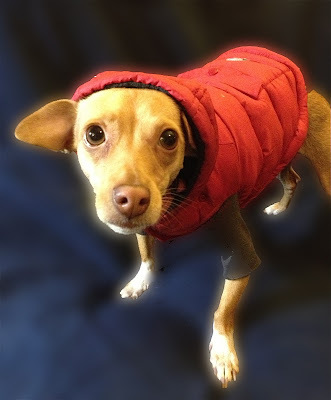 Mark's Dog Blog: Do Dogs Need To Wear Coats? Do Dogs Need To Wear Coats? The cold weather has arrived here in Boston. No more shorts and T-shirts for the normal people. But what about them dogs? Do they really need coats in this weather? When I was a kid (many years ago), my mum had a friend who would dress her dogs up in anything form a tutu to a wiener suit. I thought she was a bit weird. But, come the rain or snow, she always had them fitted out with nice hand made coats. I never understood this as I always had large dogs with nice thick fur and had no reason to think dogs could be cold. Especially the little short haired ones. If you have an Italian Greyhound, Mini Pin, Boston Terrier, Dachshund, Whippet, Chihuahua, or (in my case) a Chi/Doxie mix, you really need to bundle them up. Some of the bigger breeds may also need a coat, especially if they are of the short-haired variety. If you have a senior or sick dog on your hands, they also need a little help keeping warm in the winter. Use your instincts and pick up on what your dog is telling you. If your dog is shivering, then maybe it needs a coat. Duh. Large breed dogs with thick coats do not need the additional insulation. Their fur is designed to protect them from extreme winter temperatures. Forcing them to wear coats would be uncomfortable and could even cause them to overheat. Think of the Bernese, Great Pyrenees, Malamute, Samoyed, or Siberian Husky - no jacket required.